news Global cloud computing player and retailer Amazon today confirmed that it had added an ‘edge’ location in Sydney to speed up the delivery of content to Australians, confirming a deployment model which was the subject of speculation some 12 months ago. The company has long been suspected of rolling out datacentre infrastructure in Australia to support its Amazon Web Services business, which is one of the largest global cloud computing infrastructure players. Many within the industry have believed the first step in such an investment could be the deployment of a so-called ‘edge’ node which would allow the company to speed up the deployment of content to local users, ahead of a potential larger datacentre rollout down the track. 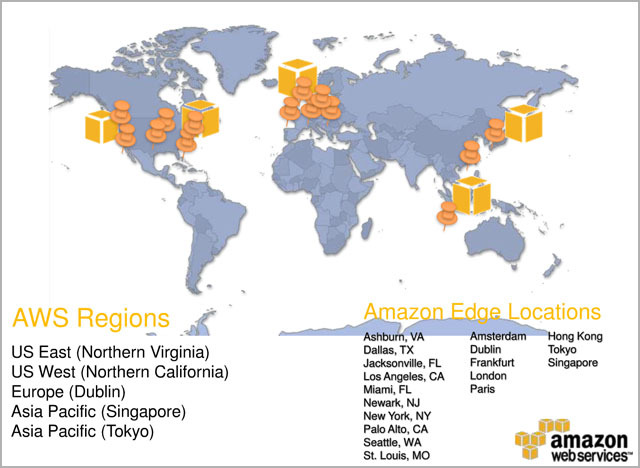 As displayed in the diagram above, Amazon currently operates so-called ‘edge locations’ in a number of other major cities across the globe, where it does not yet have dedicated datacentre infrastructure, including London, Paris, Amsterdam, Tokyo and Singapore, as well as locations in the US. The company said its new CloudFront location in Sydney supported the entire array of CloudFront features including support for “dynamic content, low minimum content expiration periods, live streaming to multiple devices using Flash Media Server 4.5 or smooth streaming, streaming media, custom origins , private content, invalidation, and custom origins”. CloudFront is the name given to Amazon’s content distribution network. However, there has also been increasing amounts of speculation over the past few weeks that the Edge node could be a fore-runner to a larger infrastructure investment. Unverified sources have highlighted a claimed link between giant datacentre operator Equinix in Australia, and last week The Register reported that Amazon intended to offer cloud computing services from an existing cloud computing datacentre in Australia. This would be a good match for the demands and size of the Australian market; as in, we have pretty stringent demands but we’re also pretty small. If they only just announced this, worlds worst kept secret. I know, we’ve been getting a constant series of tips about it. I was going to do a roundup and then this happened. As for the rest, what would a datacentre do for the region? Would it help NZ? Pacific nations? SE Asia? Would it provide a redundancy backup for other centres? Does our move to NBN influence things in any way, given the potential speed increases and IT based businesses moving here? I think you’re right, and that some sort of hybrid model will be the best result, but there are other factors at play that may help. I know a lot of Australian IT startups and some big businesses use Amazon for cloud computing stuff. I think a local datacentre would be speedily adopted by those organisations. It would help our industry development locally. I don’t think the NBN is a huge factor yet. What laws will Amazon be bound by in operating this centre? Will the data be subject to US government oversight? This is something that Amazon, and for that matter the US, need to clear up. On a slightly different matter, I have some stuff I’d like Amazon to host. It’ll involve documents that I find around the place, that may or may not be of interest to some governments. It’s always possible that I’ll host documents that have been given to me by members of a country’s armed forces, for instance, but I’m operating on a “don’t ask, don’t tell” basis. Reckon they’ll be interested? I figure I can use Paypal, and maybe Visa and Mastercard to process donations that’ll keep my venture going. Anybody’s guess at this point. Given how the US has put their own dominant stamp on other areas, I think the safe starting point is assuming that yes, the hosted data will be subject to US nosiness. Centre is here, data is here, but you work through amazon.com, and that simple .com address is enough for the US to feel justified in putting their laws in place over our laws. They’ve done it in the UK, they’ve done it with Kim Dotcom, and they’ve done it was the FBI seizure of hundreds of websites outside their boundaries. I think the evidence is allready there that they feel they have the right of way with digital data, through VERY flimsy linkage.